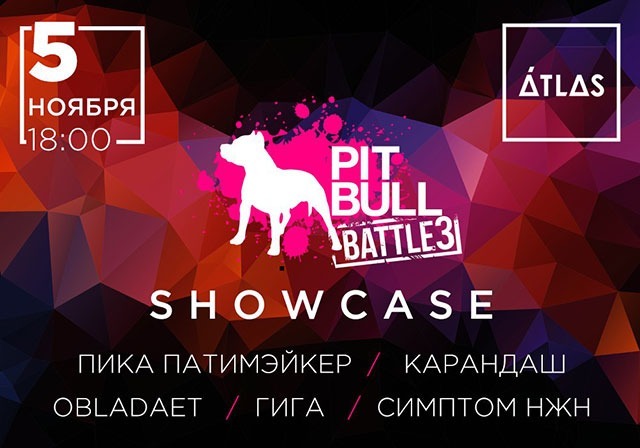 The grand rap concert Pit Bull Battle Showcase is expected on November 5 in Kyiv. The brightest and most promising Eastern European rap artists will show themselves during a concert on November 5 at Atlas night club in Kyiv. This show is organized by the Ukraine biggest hip-hop battles PIT BULL Battle. “The internet battle of best music hip-hop tracks – PIT BULL Battle (initiated by cognominal brand PIT BULL™) – has become a cult event in the world of rap. The third season of online-battle which takes place in 2016, gathered a huge audience in several countries of Eastern Europe. And the idea of ​​a live concert is a logical development of the popularity growth of the Battle itself and its artists. We expect Atlas show to be stylish and driving, as the PIT BULL brand itself”, – Elena Selyutina, the PR-director of the “New products” Companies Group, commented on the upcoming event. The Pit Bull Battle Showcase program presents rap artists who are changing the genre here and now. Thus, the November concert is a chance to see the new rap school as of 2016, and perhaps for years to come. In the showcase line-up there will be rap fans-famous Pick # Partymaker, Pencil, OBLADAET and Giga from the “Stolny grad” group. See more information about the concert at event.pit-battle.com site.